(Riding Mountain Conference Centre) and Parks Canada for a number of years. Ken and Shirley's son, Kenneth 'Blair', and his wife, Janet, live at Thompson, MB. Blair is employed with Calm Air as an Aircraft Maintenance Engineer and crew chief. Janet is employed with the RCMP. Their children, Kenneth William and Blair Alexander attend elementary school in Thompson. 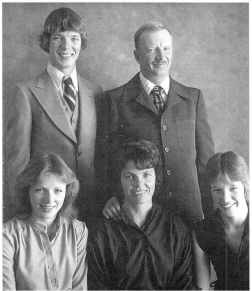 Ken and Shirley's daughter, Wanda Lynne, after work­ ing for a number of years for Manitoba Public Insurance Corporation in Thompson, ME, now farms west of Onanole and raises wild boars and Simmental cattle and is employed on a part-time basis with Canada Post in Onanole. Her children, Taylor McLean, Jenna Lynne and Cory James attend Onanole Elementary School. Ken and Shirley's daughter, Kimberley June, and her husband, Roch St. Vincent, live at Oakbank, MB. Kimberley is employed with Manitoba Public Insurance Corporation in Winnipeg, MB and Roch is a Corporal with the RCMP in Winnipeg. Their daughter, Jaclyn Michelle, attends a day care centre in Dugald, MB. 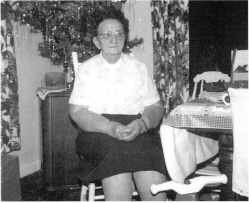 Olive Robertson (Wark-Hay), daughter of Mac and Anna Wark, and her husband, Keith Robertson, farm at Griswold, MB. Keith is retired from Canada Agriculture and now has a cow calf operation. He is actively involved in rodeo committees and spends his spare time fishing, hunting, curling and visiting friends and family. Olive plans to retire in early 2000 from Assiniboine Community College and will finally have time to ride her horses, enjoy her grandchildren, quilt, garden and perfect her fly fish­ ing skills. Skylar MacLean, Riley James and Courtney Ann.